This is Alice and Bill. They're my parents' lifelong best friends. My mother and Alice have been friends since 4th grade, and they were in each other's weddings... Alice and Bill in September 1948, my parents in November of that year. Both couples, the children of small-time San Joaquin Valley farmers, married quite young. My newlywed parents moved away from farm life, while Alice and Bill opted to live their lives there... near their parents, children, grandchildren and great-grandchildren. When we spent time with them, Alice and Bill were like second parents to me, my brother and sister, and their two children were like cousins. Alice worked for decades as secretary to the principal at the town high school, and Bill headed janitorial services at a small school for special needs children. He also worked at a local bank in the 60's. Alice has beaten cancer three times over 30 years, albeit with some unpleasant side effects. No one has ever heard her complain. Without question, Alice and Bill are the nicest and most hospitable people I've ever known. Humble and friendly, with an extraordinary peace and contentedness. They've purposely led a simple life in the same cozy home, a life unusually filled with family, friends, and endless hospitality and kindness to others. 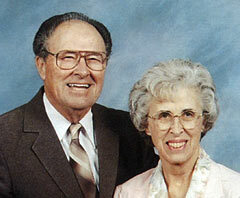 My parents received word yesterday that Alice and Bill and a great-grandchild were recently killed in a car accident. They were hit by a drunk driver (with previous DUIs), and killed instantly in a fiery crash. They were driving to a local restaurant where family waited for them to celebrate Bill's 80th birthday. Their son told the Fresno Bee that his parents "were just the most giving people that I ever knew." Please tell everyone you know: Driving under the influence of alcohol or drugs is evil. Eat Birthday Pie Every Chance You Get!